From May last year to end of last year, the service has distributed more than 40,000 e-Books to passengers from all corners of the world, and continues to grow. 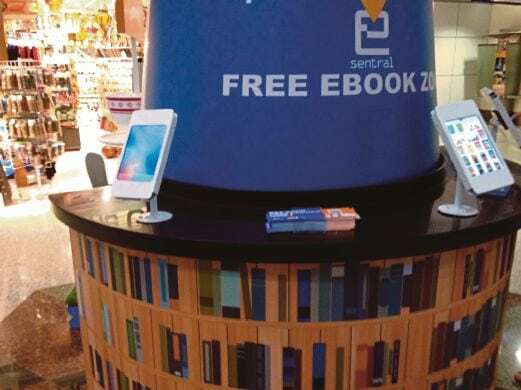 e-Sentral is the firm behind the e-Book facilities at KLIA and klia2. From data shared, passengers of various nationalities have been using the e-Book borrowing system, with Malaysians being the majority users. Novels, travel and political e-Books are the most popular genre picked by passengers. The facility, which consists of 80 e-Books beacons with 50m radius strategically placed at locations marked with flags and instructions, is considered the first Internet of Things infrastructure of its kind in the world. Currently, travellers at KLIA have a choice of more than 400 e-Book titles. Once the e-Books are downloaded, the passenger can use the e-Books while they wait or are in transit. Each passenger is entitled to borrow up to two titles for a duration of two days. I have previously reported on ebooks being given away in airports in Toronto, Broward County Florida, San Antonio, Tawan, and Seattle. Most of the projects are one-off experiments which end and are not repeated. That is regrettable, but also understandable. Travelers usually have multiple ways to entertain themselves while at an airport, so why overload an already stressed Wifi network with another project - which hardly anyone is using? The program boasted 40,000 downloads, but at the same time, the airport saw tens of millions of travelers during that period. Why invest in the tech at all if so few use it? I was at KLIA2 last week and I had a few hours spare before my connecting flight. I walked around the building to see what was available to me. Never noticed any ‘beacons’ during my walks. I am not saying it is not happening, but it was not obvious to me. The airport did have excellent free wifi. It would have been interesting to see what ebooks were available. However, I did have my kindle with me and I was already reading a book on it anyway. I guess next time I go through KL, I will look out for this service. You never know what interesting reads you may stumble upon.